More couples are living together than ever before. Most, though, aren’t prepared for when tragedy or unexpected issues happen. 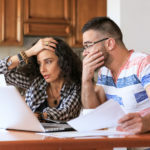 In this post, Dartmouth, Massachusetts attorney, Andrew Garcia, reveals the 3 life events that most cohabiting couples simply aren’t prepared for and how that lack of preparation can leave each partner financially crippled. Judge Judy is famous for cautioning that when you live together “you’re playing house.” Since Massachusetts doesn’t recognize common law marriage, she’s basically right: there’s no rule book for when you break up. That’s where the big difference between common law marriage states and simple cohabiting states (such as Massachusetts) comes in. When you split up in a state that recognizes common law marriage and it’s determined that you were married under common law, then when you break up the laws of divorce in that state apply. In states that don’t recognize it, though, there are no divorce laws that apply when there’s a break up. When a cohabiting couple in Massachusetts breaks up, there are no rules to provide a fair division of property or bank accounts. There’s also no law for spousal support (alimony) since there’s no “spouse” involved. We don’t like to think about the worst happening to us, but serious accidents can change our lives forever. A tragedy can occur in a split second and land a person in the hospital and unable to communicate his or her wishes. But, it’s not just accidents that can result in a hospital stay. Disability can strike anytime too. As we age, we all become more susceptible to strokes and heart attacks. Even though you’ve built a life together and you probably know your partner’s medical wishes the best, without a health care proxy in place, a girlfriend or boyfriend might be turned away by hospital staff. Furthermore, doctors certainly aren’t going to take medical directives from you simply because you live together. The third major life event that most couples aren’t prepared for is the death of the other. Again, since there is no common law marriage in Massachusetts, there are no rules that allow a surviving partner to receive an inheritance when the other dies. Without a will or any kind of estate planning in place, when one partner dies his or her assets will pass on to siblings, parents or even children from a prior relationship. Over and over again there are stories in Massachusetts of a surviving partner or fiance being told by surviving family members to move out of the house the couple had been living in “by the end of the week.” Because there was no written documentation to protect the surviving partner, they had to be out. No planning also means that the surviving partner has no control over his/her loved one’s burial or end-of-life care. Again, without the proper documentation the decisions about funeral arrangements and handling of the remains falls to surviving family members and children of another relationship. At such a heart-wrenching time, it’s likely that a surviving partner can be shut out of the grieving process. These are life events that no one ever wants to face, but it’s especially critical that cohabiting couples plan and prepare for them because there are no laws to protect them like there are for married people. Legal documents such as “cohabitation agreements,” wills, trusts, durable powers of attorney and health care proxies go a long way toward protecting couples. Planning for couples who are living together isn’t just about preparing for death, it’s about preparing for other events that can happen in life. Completing a legally binding plan in advance of tragedy is imperative. The last thing that anyone wants to deal with during a tragedy is arguing with relatives over a partner’s last wishes, fighting with hospital staff or finding yourself thrown out of your house by your partner’s survivors. If you’re ready to take the first step toward protecting yourself just contact us at The Living Together Law Center.